Ending homelessness one step at a time! Bring your family, friends and coworkers to DuPagePads 14th Annual Run 4 Home. The CARA certified race and USATF certified course will take runners and walkers through scenic streets of Wheaton and back to DuPagePads for a celebration, including the Run 4 Home Kids Corner, featuring games, prizes, face painting and more! Take a step to end homelessness and register today! Pre-registered participants are guaranteed to receive an official DuPagePads Run 4 Home shirt. Register before August 18th and save! Online registration is available until September 13th. Do I need to be an athlete to participate? No, you don’t need to be an athlete to participate. All ages and abilities are welcome to walk or run. The 5K distance is 3.1 miles and the 10K is 6.2 miles. The course is USATF Certified. 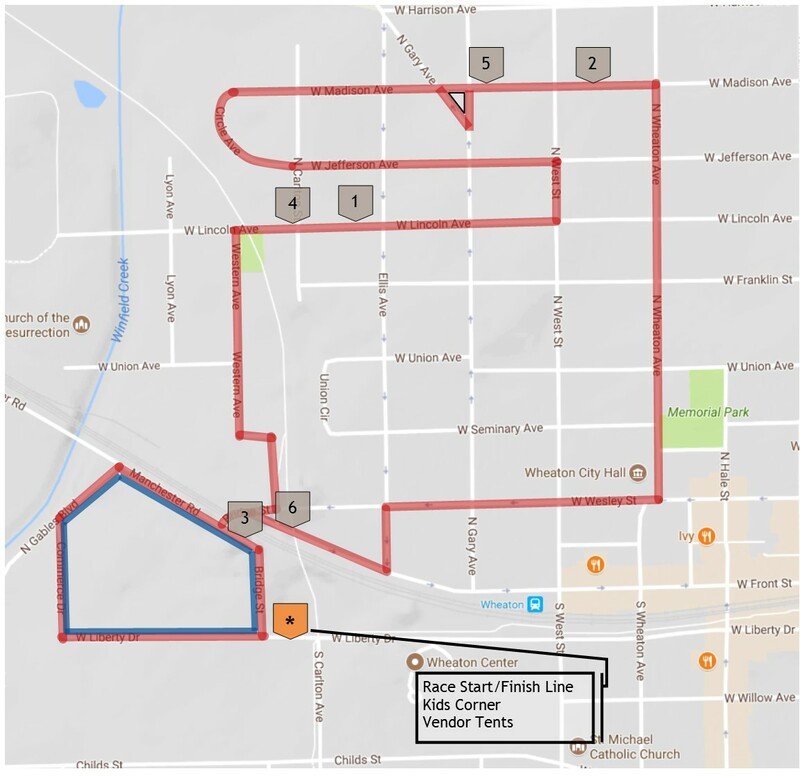 See the map below for a description of the course and printable turn-by-turn directions. Should I register as a walker or runner? If you would like your race results to be chip-timed, sign up as a runner. Runners are also eligible for awards based on their age, gender and finishing time. The course is USATF Certified. 5K Walkers and participants in the 1K Family Walk distance will not be chip-timed. For safety, baby joggers are only permitted for those who are walking. Yes! Runners are chip-timed. Check back here after the race for results. Awards will be given by age and gender and an awards ceremony will take place that morning at 9:30am. virtual goody bag with coupons sent out after the race. Yes! Kids can sign up to run the 5K or 10K or walk the 5K or 1K. All children 13 and under must be accompanied by a parent, guardian or other responsible adult at all times. The top three 5K and 10K runners in this category will be eligible for the Ross K. MacNeill Award, given on the stage at the award presentation at 9:30am. The Run 4 Home Kids Corner features face painting, games, prizes & more. *These activities are not designed to provide childcare and parents are expected to provide appropriate supervision at all times. Do I have to pay for my baby or toddler? The race is free for children 5 and under. Are jogging strollers or dogs permitted on the course? For your safety, strollers and baby joggers are only permitted in the 5K or 1K Walk. All other wheeled vehicles (excluding wheelchairs) and dogs are prohibited. When does online registration close? Are there opportunities to register by mail or in person? Registrations can also be completed by filling out a registration brochure and mailing or dropping off at 601 West Liberty, Wheaton with your registration payment. In person registration is available at 703 West Liberty, Wheaton on Friday, September 14th from 4:00pm-7:00pm or Race Day, 6:30am-7:30am. Register before August 18th and take advantage of Early Bird pricing! Pre-registered participants are guaranteed to receive an official DuPagePads Run 4 Home shirt! Participants will receive a t-shirt and shirts sizes are based on a first-come, first-served basis. In an effort to be more green, all participants will be emailed a virtual goody bag with coupons following the race. A friend or family member may pick up your packet for you if they show physical or electronic proof of registration. Parking is available at the municipal lot on the South-West corner of Carlton and Liberty. Do not use the parking garage. Water stations will be available on Madison & Carlton, and near the Start/Finish Line. Delicious food and beverages will be provided in the registration tent. Rain or shine, the race is on! Exceptions will be made in the case of lightning or if another safety issue should arise. Please note our safety communication system of signs throughout the course. At the start line and the water station, a sign with a color will signify course safety in the case of an emergency. Will there be a bag check to hold my items while I’m on the course? Bag Check will be available under the large registration tent. What are the Award Categories? Did I hear you were giving Door Prizes? King of the Hill – Be the first male and female to reach the top of the hill at Manchester and Bridge street (about a half a mile into the race) and be crowned King & Queen of the Hill! All registered runners and walkers will be entered in a door prize drawing. Check the large board near the registration tent after the race to see if you are a winner. Yes! Please do and share on social media. Feel free to “tag” our page @DuPagePads. Is there anything to do after the race? Following the event, be sure to stay around and visit our vendor tents! Where can I find my race results and see event photos? Runners can view their times at kiosks or the Timing Company table near the finish line. Run results and event photos will be posted at: www.padsrun.org after the race. If I can’t attend, can I have a refund? Sorry, no refunds. However, your admission fee will go towards housing programs and support services for families and individuals who are homeless in DuPage County. DuPagePads Run 4 Home needs more than 200 volunteers on race day. Groups are welcome! Registered volunteers receive continental breakfast, volunteer t-shirt and certificate confirming hours completed. *Volunteers to help clean-up from 10:00am-11:00am. For more information or to register as a volunteer, please contact Josie Mattern, Volunteer Coordinator at volunteer@dupagepads.org or 630.682.3846, ext. 3500. The 1K Family Walk is highlighted on the map in blue. Water stations will be available on Madison and Carlton, and near the Start/Finish Line. A First Aid Station will be available near the Start/Finish Line. Race Results View Event Photos More Event Photos!